Do you suffer from constipation? It could turn into a more serious condition if you aren’t careful. I’m sure you already know about the importance of a healthy diet. But today, I’m going to focus on one component of a healthy diet—fiber. 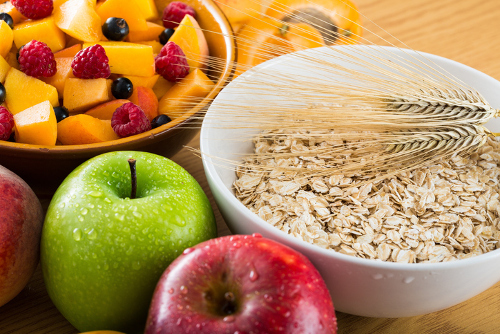 Fiber is a type of carbohydrate in fruits, vegetables, and grains that the body can’t digest. So, it is diverted out of the stomach and small intestine into the colon, where it helps form soft stools that are easy to pass. That said, the absence of fiber leads to constipation where the sufferer strains to pass hard stools. The straining may cause increased pressure in the colon, which in turn causes small pouch-like sacs (diverticula) to bulge out through weak spots in the colon. As the lining of the colon becomes weak with age, the pouches occur more frequently, leading to a condition called diverticulosis. Americans are more prone to this condition, thanks to our low-fiber diet consisting mainly of meat, dairy, and processed foods. In fact, almost half the population over 50 suffers from diverticulosis. Diverticulosis in itself is not painful. But when the diverticula become inflamed (diverticulitis), it can lead to severe pain. The cause of the inflammation is not clear. It could be triggered by bacteria or stools that are caught in the diverticula. Diverticulosis vs. Diverticulitis: What Are the Differences? It is very important to be able to differentiate between diverticulosis and diverticulitis. The reason is that the management and treatment of diverticulitis is very time-sensitive and critical, like in appendicitis. Although most people with this condition do not have any symptoms, some will experience abdominal bloating and constipation. They may also suffer from crampy pain or discomfort in the lower abdomen. The most common symptom of diverticulitis is abdominal pain and tenderness in the lower left side of the abdomen. Usually, the pain is severe and comes on suddenly. It can be accompanied by cramping, nausea, vomiting, fever, and even chills. A colonoscopy can confirm the diagnosis. In fact, if you are over 50, get a colon exam done, even if there are no symptoms. Not surprisingly, the treatment of both conditions is quite different. In the case of diverticulosis, a high-fiber diet containing fruits, vegetables, whole grains, and rice will help manage the condition while pain medications help relieve symptoms. Diverticulitis, on the other hand, calls for oral antibiotics and a strict liquid diet. In some cases, the diverticula could be inflamed enough to rupture and cause peritonitis, a serious and life-threatening condition. In such cases, the patient might require a hospital stay, intravenous antibiotics, and possibly surgery. To prevent surgery, you need to prevent diverticulitis, for which you need to avoid diverticulosis and the constipation that leads to it. So, be sure to eat more fiber starting today! “Understanding Diverticulosis and Diverticulitis,” MedlinePlus, Winter 2010; https://medlineplus.gov/magazine/issues/winter10/articles/winter10pg20-21.html, last accessed August 18, 2017. “Diverticulitis,” Mayo Clinic, August 7, 2014; http://www.mayoclinic.org/diseases-conditions/diverticulitis/basics/definition/con-20033495, last accessed August 18, 2017.